Emory University will send four outstanding graduating seniors to the University of St Andrews in Scotland through the prestigious Robert T. Jones Jr. Scholarship program next year. Each year, both Emory and St Andrews host the “Bobby Jones Scholars,” selected from among the top students at each institution. 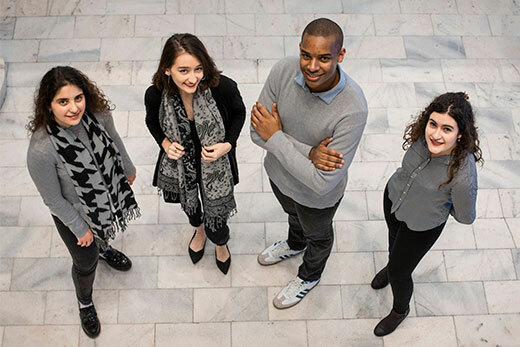 Emory College of Arts and Sciences students Farah Al Chammas, Claire Barnes, John Priddy and Camila Reed-Guevara will join the community of more than 300 scholars who have participated in the program since its inception in 1976. “Each year, the quality of applicant astounds the interview committee. To be presented with the caliber of finalists we saw this year — students who have left their mark on the Emory campus — makes our job in selecting only four winners very difficult,” says Catherine Lewis 90C, chair of the Emory Bobby Jones Advisory Committee. The students are free to choose their own course of study in Scotland from among the available degree programs or a non-degree course of study. This year, one scholar will pursue a self-selected course of study, while three have elected to pursue master’s degrees in diverse fields such as international political theory, legal and constitutional studies, and classics. Described by a recommender as “a community organizer, and global humanitarian,” Damascus- born Farah Al Chammas is a Robert W. Woodruff Scholar. An anthropology and human biology major, with a second concentration in interdisciplinary studies, Al Chammas intends to pursue a diverse course of study combining courses from management and psychology during her time in St Andrews. Originally arriving in the United States as a refugee from Syria, Al Chammas has spent much of her time at Emory helping those who found themselves in Atlanta through similar circumstances. “I discovered a growing refugee community [in Clarkston, Georgia] 15 minutes from my dorm room,” says Al Chammas. Working with local officials, Al Chammas launched the now 150-member strong student Refugee Revive organization to empower the local refugee community through education and entrepreneurship. A scholar and food aficionado, Al Chammas pitched a sidecar course as part of her time as an IDEAS Fellow at Emory. The course focused on immigration, food and community, which included taking a group of students to eat a meal with a Syrian family. The experience was “the highlight of the course,” according to one faculty member. In addition to her activities at Emory, Al Chammas has interned with both the Office of the Mayor of Clarkston, and with the University of Texas Health Northeast, where she conducted lab research on colon cancer. A philosophy and religion joint major with a sustainability minor, Claire Barnes describes herself as interested “in new ways of learning and thinking.” This curiosity led to a study abroad experience with a Tibetan monastic community in India through the Emory-Tibet Partnership. The California native is a Dean’s Achievement Scholar and senior resident adviser. She has set her sights on a career in academia and dreams of being the United States ambassador to the United Nations. “The International Political Theory program at St Andrews will bridge my interest in global perspectives and training in philosophy and religion,” Barnes explains. A Phi Beta Kappa recipient and member of the Omicron Delta Kappa honor society, Barnes also serves as a Fox Center for Humanistic Inquiry Fellow. She has earned significant accolades during her four years on campus including the opportunity to represent Emory as an observer and delegate at the United Nations Climate Change conference in Bonn, Germany, in 2017. “The university has shaped my academic path, and love of teaching and learning,” she says. Hailing from Colorado, John Priddy is the current executive vice president of the undergraduate Student Government Association (SGA). Described as “an academic go-getter” by one of his recommenders and “hardworking and driven” by another, Priddy is a political science and history double major. His honors thesis centers on the factors that influence public opinion of solitary confinement within the United States criminal justice system, and the impact of race and the nature of an offence on framing those opinions. Beyond SGA, Priddy has established himself as a true campus leader through a wide range of positions, including time spent as a resident adviser and a diversity initiatives fellow in the Office of Undergraduate Admission. He also served on the search committee for Emory’s newly appointed vice president for Campus Life. A member of the Omicron Delta Kappa honor society, Priddy has served as team captain of Emory University Mock Trial and has interned with both Senators Michael Bennet (D-Colorado) and Doug Jones (D-Alabama). Priddy is passionate about seeing the recognition and actualization of LGBT+ rights through legislation. After his time in St Andrews, Priddy plans to attend law school to study reformative justice solutions for the carceral system. Ultimately, he hopes to be able to influence legislation concerning punitive polices implemented against incarcerated persons across the world. “I hope to advocate for the end of the use of cruel and unusual punishments,” he says. Camila Reed-Guevara of Salt Lake City, Utah, is a classics and philosophy double major. The Woodruff Debate Scholar, Mellon Mays Undergraduate Fellow and Phi Beta Kappa recipient has spent her college years representing Emory nationally as part of the Barkley Forum Debate and through service to the Atlanta Urban Debate League (AUDL). Reed-Guevara’s zeal for her academic pursuits is apparent. She has undertaken work as a research assistant in classics and founded “Tesserae,” an undergraduate classics journal at Emory. This academic work has led to tangible results on the Emory campus. She has interned with Emory’s Commission on Racial and Social Justice, serves on the search advisory committee for the university’s new chief diversity officer and continues to work with the AUDL. “The AUDL provides debate education to students at underfunded Atlanta public schools and is where I was able to begin repaying the tremendous gift I had been given in my scholarship to Emory,” Reed-Guevara says. In addition to the four winners, Jordan Chapman and Leigh Schlecht were named as Emory’s alternates. The University of St Andrews has announced that their students Fiona Blackwood, Libbi Carruthers, Iain Millar and Iain Smith will join the Emory community in August as Bobby Jones Scholars.